Oboke and Koboke are the valleys located upstream of the Yoshino-gawa River in the western area of Tokushima. The Shikoku Mountains dike was washed out by the main stream of the Yoshino-gawa River, the largest river in Shikoku rising from the Ishizuchi Mountain Range and flowing down through three prefectures, Ehime, Kochi, and Tokushima, and the valleys were formed as a result. "Boke" means "dangerous to walk along." O-boke (big boke) and Ko-boke (small boke) are said to have been so named because the V-shaped sheer rocks make narrow paths that are very dangerous to walk along, no matter how carefully or slowly you walk. From the observation platforms and promenades along the JR Dosan Line and Route 32, you can take in a full view of the magnificent scenery of the whole valley. For a better look and to enjoy the natural beauty of the valleys, a sightseeing boat shoots down the rapids from Oboke to Koboke. You can also see interesting rocks, like the Komori (bat) Rock and the Shishi (lion) Rock, from the boat. 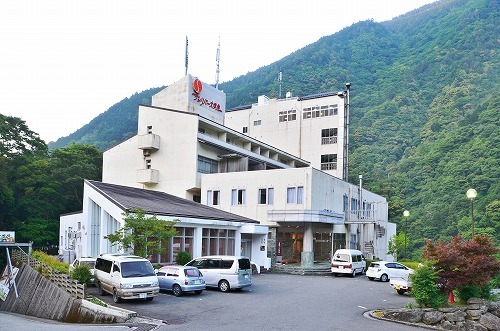 Oboke Onsen Hotel Sun River Oboke is located at Oboke gorge. This hotel overlooks the gorge and hot spring is said to be good for the skin. Dinner is served by the ingredients from Yoshino River and Tsurugi mountains.